Past week was a really good week. I closed my DAX trade, for which I talked about HERE. I managed to get around 400 points from this move. I was sharing updates with my followers during my journey. I must say that even though it looks like an easy process, it takes a lot of energy and strong psychology to hold onto a trade for a long period of time. I also shared with you my thoughts on GBPUSD last week. It seems to be moving in the direction I was expecting it to. Unfortunately I did not take any trades in this pair. In the end, I do not like to overstretch myself between trades. My whole attention was absorbed by the DAX trade and it did really pay back awesomely. Overtrading is one of the worst things you could end up doing. Even if there is a very good trading setup, I am trying to stick to my trading rules and strategy. Today I also want to share with you my thoughts on Crude Oil. It has been quite some time since I last wrote about it. 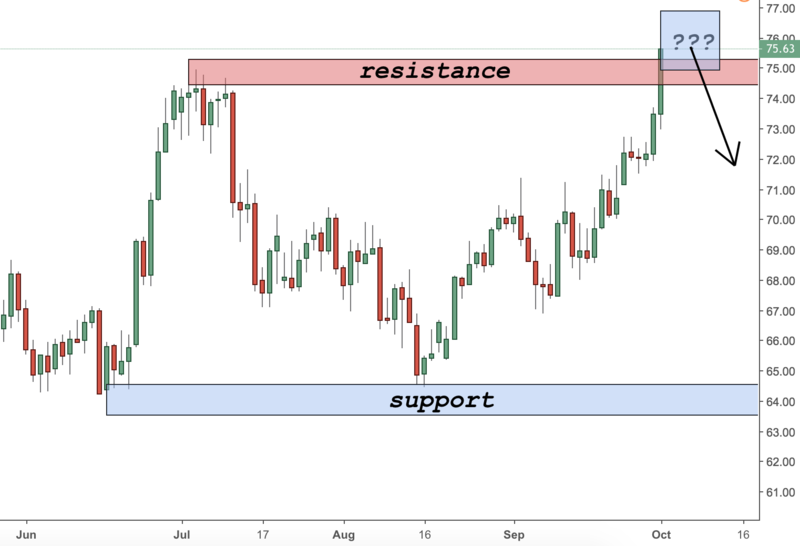 Crude has just reached a major resistance level. I am more inclined to believe that we might experience a reversal at this point but will NOT take any action before a price action pattern confirm my expectations. SO FAR THERE IS NOT SUCH! Therefore, I will keep on monitoring crude oil and if I see what could be a good shorting place as according to my trading strategy, I will take action. A potential reversal can take us back to the 65.00 level. Alternatively we might experience a breakout. If that happens, I will be looking for a confirmation from the daily chart.